It all started with a Vogue profile and a picture of a beautiful woman, surrounded by her three children, talking about the complexities of balancing work and motherhood. The name Les Foulards de Juju also caught my eye and piqued my curiosity about the brand and its founder Julie-Anne Dorff. We exchanged e-mails and tried to organise a meeting, but in the meantime Julie-Anne kindly sent me some scarves to try on and to photograph. Imagine paisley scarves – cosy, unusual, with no annoying label tags. They come in different sizes, from small square ones that little girls love ( men can wear them as pocket handkerchiefs too) to bigger ones, cut similarly to a cummerbund that you can wear around your neck, like a neck-tie or casually tied on top of the trousers, instead of a belt. Add beautiful shawls to the mix, which you can wrap yourself in on a chilly summer evening-it reminds me of a paired down Pavlovoposadskye platki (shawls) but with a distinct European soul. One summer morning we finally met in a cafe close to Julie-Anne’s home. I saw a long-limbed young woman, in a slightly worn-in pink sweatshirt, with a flirty zip at the shoulder and dark shorts, her make-up-free face prettily flushed from a morning run and her hair tied in a high ponytail. There was a charming insouciance about her, with a calmly relaxed manner and a gentle smile playing on her lips. While she looked coolly French, there was warmth and a spark in her eyes and she really came alive when talking about her work and her children in equal measure. Julie-Anne grew up in a French countryside, where she enjoyed the sense of freedom while toying with the idea of becoming a veterinarian, which later gave way to thoughts about journalism. In the end Julie-Anne followed her heart and studied for a Baccalaureate in Literature and Philosophy and then completed a Masters degree in Marketing & Communications at Emerson College in Boston. In France internships are an integral part of the educational process, so when an opportunity arose to do some fund-raising for Chanel, Julie-Anne didn’t think twice and jumped on board, ending up with an internship for the brand’s PR in New York. The experience was transformative with ‘lots of very forward thinking people who set the trends’ and gave Julie-Anne ‘the best crash course education in working ethos with the highest standard of quality and the ‘training’ of the eye’. During that time Julie-Anne met her husband-to-be and the young couple moved to London, where Julie-Anne worked for Chanel for 13 years, doing PR and covering such diverse lines of business as couture, fine jewellery and beauty. Work didn’t prevent Julie-Anne from becoming a mother and she now has three children, two girls, aged nine and 21 months and a boy of seven. After having a third child and realising that her eldest daughter was fast growing up, Julie-Anne did a complete head turn and took a year & a half off, concentrating solemnly on her children but as life goes, when there is a buzzy, curious brain involved, things and opportunities arise unexpectedly. While shopping for curtain fabrics to decorate her own home (during her travels Julie-Anne sources out interesting fabrics and brings them home), she decided to buy 30 meters of fabric and make-…scarves, as she truly felt that she needed a creative outlet. Things fell into place fairly fast after that, with the lady who made the curtains offering to make scarves for Julie-Anne, based on her designs and specifications (‘if you tell me what you want, I will do it for you’). Julie-Anne calls herself a ‘practical dreamer’ and says that inspiration comes from things and people that she observes on a daily basis – looking through magazine pages, running after children or seeing people out and about. In Julie-Anne’s view ‘London is a wonderfully empowering city to live in, as people are encouraging and receptive and it gives you the guts to do things creatively’. Working at Chanel taught her to work hard and be very professional, while being a mother presented a completely different set of lessons. ‘We beat ourselves up too much, while trying to be the best mum’-when I hear those words, I can’t help but nod my head in agreement, as this subject arises in so many of my conversations with girlfriends. What is particularly fascinating about Julie-Anne, is that unlike many women I know, she refuses to succumb to the feeling of guilt when combing work and motherhood. Instead she says (very genuinely and convincingly) that she is at peace with herself. When she works, she gives it her all, and the same rule applies when she dedicates her time to her family. 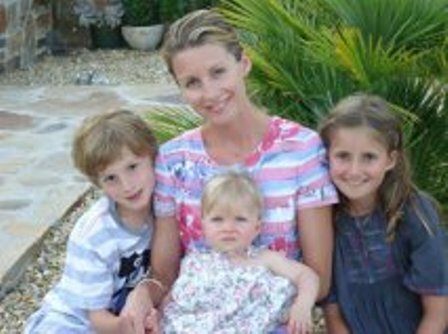 When Julie-Anne took the time away from work to be a full-time mum, it allowed her to pause and reflect and with it came the realisation that a simple thing like a scarf, which can easily complete an outfit, on average costs £70-£80 ( let’s not ponder the cost of Hermes scarves here for the sake of the argument ). For Julie-Anne the idea of creating her own scarves is more about the notion of friendship and sisterhood. Instead of buying flowers (on most occasions women tend to give flowers to each other, as tokens of appreciation or to raise a smile on a gloomy day) one can instead purchase a scarf as a gift to oneself or a girlfriend, without the sense of guilt, as it can easily make you feel smartly pulled together without breaking the bank (plus scarves don’t go in and out of fashion – once you know how to tie them in different ways, you are ‘set’ for years to come). Les Foulards de Juju scarves are British made and are created from the ‘end of the line’ fabrics, with the prices starting from a mere £10 (small carre for girls) and rising up to £40 (for a large shawl). Price point was a very important consideration, as Julie-Anne wants her customers to bridge a frontier of the so-called ‘affordable luxury’ ( the scarves are also machine washable and don’t have to be dry-cleaned). This brand means a great deal to her (in part because it is her personal creative outlet) and you will know this for sure when you first touch any of Les Foulards de Juju scarves-my daughter refuses to be parted from hers now and when it is tied around her neck, her face lights up and she looks incredibly chic, albeit her young years. Some might consider fashion frivolous but it is anything but, if you don’t follow trends blindly and focus instead on interpreting your personality through the pieces that you wear and that form your wardrobe. As Julie-Anne puts it ‘how you tie the scarf tells a lot about your style’. Each Les Foulards de Juju scarf is unique and comes in Liberty print, made out of Italian or Irish linen which is cosy, casual, dressy and durable in equal measure. They bear no label (I ask Julie-Anne about it and almost have to bite my tongue realising my own silliness when Julie-Anne patiently explains that we all get annoyed by them rubbing against our necks ) and in a way you will feel like a person ‘in-the-know’ when wearing Les Foulards de Juju-it’s not the label that make the item, it is how often you wear it and how it makes you feel, isn’t it?! There are only about 10-15 scarves in each style (depending on customers requests and allowing for the availability of a specific fabric, more can be made) and initially Julie-Anne sold them from her home, trunk-show like. It was convenient and practical as a marketing measure to gauge her friends and clients fashion response. When the first collection sold our, Julie-Anne was speechless with surprise, so now she does two collections a year, one around January and another in spring-time. Julie-Anne insists that Les Foulards de Juju was started first and foremost ‘for the love of doing it’. Why the name ‘Les Foulards de Juju’ ? Well, ‘foulard’ means ‘scarf’ in French and Juju is Julie-Anne’s nickname, so merging the two seemed like a natural combination. The uniqueness of those scarves also comes from a specific inspiration behind them, the moment in time that is timeless and precious in equal measure, like a specific song or a favourite perfume lingering in the air. It is a rare occurrence to hear a person say out loud that he or she really enjoys making people happy. As Julie-Anne accurately states, we are the ‘generation of the High Street’ when major catwalk looks are almost instantly copied and automatically reproduced by retailers, so at times it might seem that we are wearing the same outfit or channeling a specific character, yet adding a scarf changes your look instantly and speaks volumes about your personality. Did she make any mistakes, I tentatively ask? Julie-Anne smiles and says that the one that is the most obvious to her was that she stopped working after 13 years of doing it non-stop and did a 360 degrees switch to full motherhood, which made her feel like ‘I retired in a bad way’. We live in a society that puts lots of pressure on women (rain or shine there is still plenty of inequality when it comes to men and women), so the only way forward is ‘to be yourself’. Julie-Anne says that it is important to have a life outside home, to work, to exercise (she tries to do it at least once a week), to eat well (with indulgencies during the weekend) and trying not to be perfect, knowing that you do your best on a daily basis. As we sit and talk about scarves, I ask for Julie-Anne’s expert tips about the best way to tie each of her designs. She happily obliges and demonstrates them to me. With the little ‘carre’, you can tie it around your ponytail or around your wrist, like a cute bracelet. With the slightly bigger scarf you can ‘fasten’ it with a brooch or tie it around your trousers/jeans ( I can chirp in and say that I got countless compliments on my summer holidays by wearing one of Les Foulards de Juju creations this way-it made me feel giddily stylish by just doing this in front of a mirror-vain girl? Moi? Never!). And with the larger shawls you can throw it on top of your blazer or around a little black dress, to raise the style stakes. In all fairness, try experimenting with them yourself, it is so much fun to use your brain creatively for a change! In actual fact, Les Foulards de Juju customers start with buying a scarf or two for themselves and then extend the pleasure by purchasing them for their mother, sister or girlfriends, thus expanding the circle of style. French women are considered to be more stylish than many of their counterparts around the world, as they tend to be feminine and gamine, always stylish but never over-the top. Julie-Anne gently reinforces this point by saying aloud that one should never forget that you are woman. Every time she is in Paris she gets reminded of the uniqueness of the French women’s approach to life, as practically at every corner you can see a lingerie shop. By comparison what you see on every high street in London is mostly bakeries, estate agents and mobile phone stores, I think to myself….. When it comes to fashion Julie-Anne favours simplicity ‘with considered details’, so she currently favours British brands like Erdem and Roksanda Ilincic, as well as the European designs from Armani, Karl Lagerfeld and Raf Simons, who bravely took on the mantel at Christian Dior and is already putting his very distinct imprint on the brand, while respecting its history and traditions. If all that doesn’t make for a busy schedule, life laid out another surprise before Julie-Anne recently, when she was invited to join the newly formed team of Harper’s Bazaar UK under the leadership of inspiring and inspired Justine Picardie in early January (since she became the editor, the magazine upped its game with incredible range of subjects by amazing writers and stunningly poetic visuals, thus creating a magazine for a smart woman who wants to continue evolving, instead of resting on her laurels) and is now the magazine’s Executive fashion & jewellery editor, which she describes as doing a job similar to a PR, acting as a link between advertisers and magazine’s creative team. She is still finding her footing in that role but loves the daily learning and creative process of her job (when we were trying to set the date for an interview, Julie-Anne was packing for Paris Fashion Week). At a time when you are more likely to see people drumming their own drum, it is so refreshing (and if I am totally honest, quite inspiring as well!) to see someone who has worked for a world-renowned brand in the past and is now working for a fantastic publication, yet remains firmly grounded and truly complete, at ease with herself and her flow of creativity. Julie-Anne might not be trying to change the world, but she certainly aims to make it a happier place for women in particular, by offering them a pleasure of a purchase that will make each one feel unique. Galina, your piece about the scarves is a great read, I feel tempted to buy some now and Juju certainly is an inspiration…well written indeed!